As he proved with the shocking ending of Line of Fire, Stephen White is not afraid to blow his characters’ world to smithereens. 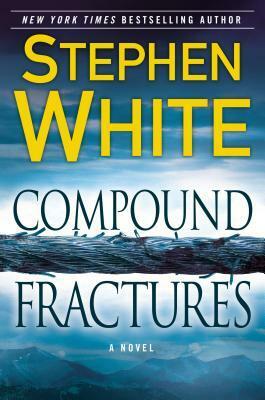 In Compound Fractures, the final book of the Alan Gregory series, White holds nothing back. Secrets are revealed, long-held beliefs are shattered, and poor Alan Gregory’s life just spins faster and further out of control. I’ve followed the Alan Gregory series from the beginning, and love the psychological insights into criminal behaviour. Unlike Jonathan Kellerman’s Alex Delaware series, White has no compulsion about killing off major characters or destroying illusions. Fairly rare for a series, nothing in Alan Gregory’s world is sacred, and while I still can’t forgive what White did to poor Adrienne, I have to admire his take-no-prisoners stance. From Line of Fire, I knew I could expect Compound Fractures to be epic, and indeed, far from winding down, White ratchets it up all the way to the final few pages. Personally, I think he took it too far. There was a lot going on in this book, and a lot of major revelations made. White’s strength is in psychological realism, and the intimate, personal moments between characters that hit hard. There’s some of that in here but because there was so much of it, White squanders many an opportunity to explore these characters’ psyches. The result is a bit of a soap opera take on events – we are told certain things, we are shocked by certain revelations, and we wish we could delve deeper, but alas, the series is at an end. For example, we learn why Diane acted the way she did in Line of Fire, but unfortunately, she is mostly absent in this book and so we barely get a chance to understand her motivation. Considering how anomalous her behaviour was, I did want to hear more from her, and at least get a taste of what was running through her head at the time. Lauren as well is revealed to have a secret that incredibly impacts upon Alan. I love the psychological realism of Alan’s response, and I particularly like how the use of Christian Louboutin shoes reveals the complexity of Lauren’s feelings about her multiple sclerosis, but again I wish the other characters privy to this secret reacted in a less caricature-like manner. An incident from Sam and Alan’s past comes to a head in this book, and while that forms the bulk of the mystery component of this book, and while it certainly ratchets up the tension, it mostly felt tacked on. I didn’t really understand Alan’s distrust of Sam, considering how long they’d been working together, and with regard to this plot thread, I mostly found Alan annoying. Finally, the Elliott Bellhaven subplot started out utterly fascinating, but the big reveal at the end felt contrived. Again, White is at his best when dealing with the personal, so adding the large-scale political angle to Elliott’s story when there was already so much going on with him, seemed jarring. That being said, it’s a fantastic series, and while I think White could have done more with the book, I was mostly satisfied with the ending. I loved seeing these characters grow, and I especially loved how deeply personal this story felt with regard to Alan Gregory’s character. He’s changed a lot from the beginning of the series, and by the end of the book, you can’t help but feel wistful at letting him go, but at the same time also feeling like it’s time to let him rest, and to give him privacy to deal. Thank you to the author’s manager for a copy of the book in exchange for an honest review. This entry was posted in Book Reviews and tagged 50BookPledge2013, Fiction, Mystery by Jaclyn. Bookmark the permalink.